Each player has a hand of eight balloon cards. 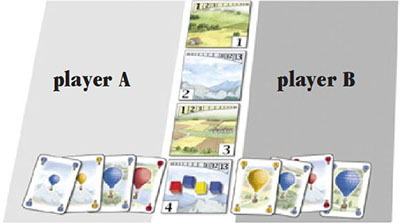 The players play their balloons on mountain or plain hops. 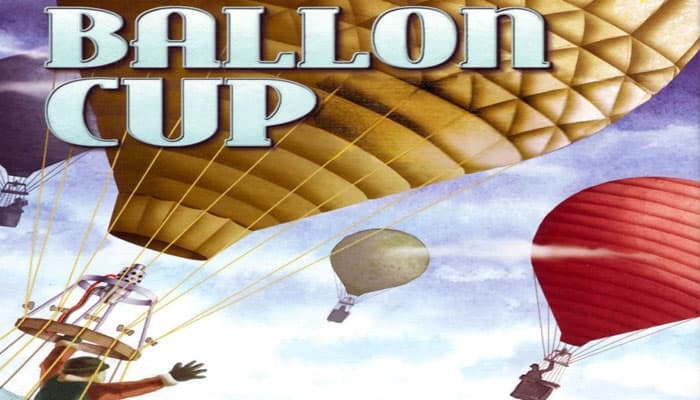 Players play their high-valued balloons on the mountains and their low- valued balloons on the plains. Players usually play their balloons on their side of the hops, but winds (and cunning) can cause them to play on their opponent's side, a move that can ruin their opponent's plans. High value cards are best in mountains. Low value cards are best in flatlands. 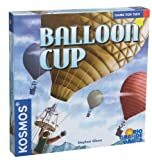 There are trophies in the 5 balloon colors. The number on the balloon shows how many victory cubes of this color a player must have to claim the trophy. Players place their balloon cards next to the balloon hop tiles, trying to collect victory cubes in the right colors so they can claim trophy cards. The first player to take 3 of the 5 trophy cards is the winner! Place the 45 victory cubes in the bag and mix them. Place victory cubes on the balloon hop tiles. Randomly draw victory cubes from the bag and place them on the balloon hop tiles: 1 on tile number 1, 2 on tile number 2, 3 on tile number 3, and 4 on tile number 4. Shuffle the balloon cards face down and deal eight cards to each player. Each player takes his cards into his hand, keeping them secret from his opponent during the game. Place the remaining balloon cards face down as a supply next to the board. A discard stack will form next to it. If, during the game, the supply is exhausted, shuffle the discard stack and place it face down as the new supply. Place the 5 trophy cards face up near the board. The players decide who will start. The players then alternate turns. On a player's turn, he selects a card from his hand and places it face up next to the balloon hop tile of his choice. He may place the card on his side of the tile or on his opponent's side of the tile. Then, he draws the top-most card from the supply and adds it to his hand, ending his turn. The number of victory cubes on a balloon hop tile determines the number of balloon cards that must be placed on each side of the tile. The colors of the victory cubes on a balloon hop tile determine the colors of the balloon cards that must be placed on each side of the tile. Example: there are 2 blue, 1 yellow, and 1 red victory cubes on balloon hop tile number 4. nus, the players must place 2 blue, 1 yellow, and 1 red balloon cards o n each side of the tile. The players place the cards so that they overlap, but do not cover cards previously placed. Thus, all placed cards can be seen. If the only card a player can place will help his opponent, he must place it. A player may not choose to place no card on his turn. If a player cannot place any of his 8 cards, he shows them to his opponent to prove he cannot place a card. If he can place a card, he must. If not, he may discard up to 4 cards (choose how many first) and draw the same number from the supply. If he now can place a card, he does. If not, he again shows his cards to his opponent to prove this. If he can place a card, he must. If not, he ends his turn without placing a card. 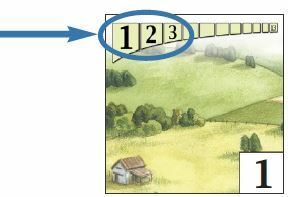 When the required number of cards have been placed on both sides of a balloon hop tile, the tile is scored and the victory cubes given to the winner. Example: the number 2 balloon hop tile has 2 cards of the required colors on each side, so it is immediately scored. 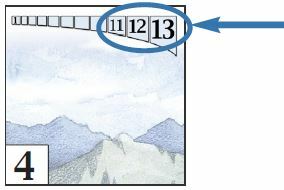 If the tile being scored is a mountain, the player with the highest sum of balloon cards on his side of the tile takes the victory cubes there. 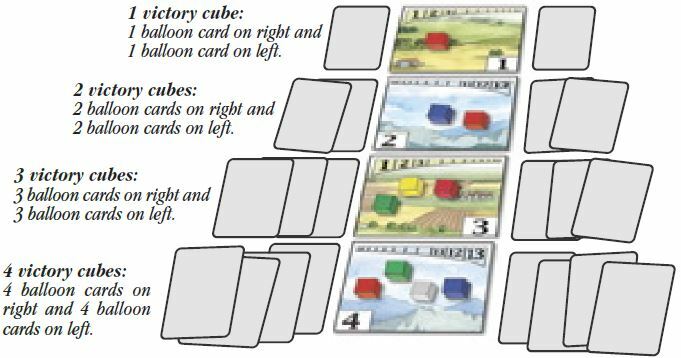 If the tile being scored is a flatland, the player with the lowest sum of balloon cards on his side of the tile takes the victory cubes there. If the sums of the balloon cards on both sides of the tile is the same, the player who placed the last card wins and takes the victory cubes there. It matters not on which side the last card is placed nor whether the tile is mountain or flatland. The winner takes the victory cubes on the tile and puts them in his play area. The winner discards all balloon cards from both sides of the tile. The winner turns the tile over. Thus, mountain becomes flatland or flatland becomes mountain. The winner draws as many victory cubes from the bag (without looking) as the number on the tile and places them on the tile. Now the players check to see if the winner has enough victory cubes to take one or more of the trophy cards. If so, he takes the card(s) he can. The game now continues with the player who lost the tile scoring. After scoring a balloon hop tile, the players check to see if the winner has the required number of victory cubes in one or more colors. When a player has the required number of victory cubes of a color (or more), he puts the required number of cubes back in the box, takes the trophy card of that color, and places it face up in his play area. Once taken, a player cannot lose a trophy card during the game. The players keep any extra victory cubes in this color and can continue to win victory cubes in this color during the rest of the game. When a player claims a trophy card, he can use 3 victory cubes in the color of an already claimed trophy card, as one victory cube in the color of the trophy card he is claiming. The player does not actually get the new cube as the trade occurs when the player has sufficient cubes, including 3 for 1 traded cubes to claim a trophy card. The cubes used in a 3 for 1 trade must all be the same color. He may trade more than one set of 3 cubes to claim a trophy card. Example: the yellow Imply card has been taken. Kevin has 4 green victory cubes and 3 yellow victory cubes. He puts all 7 of them in the box to claim the green trophy card. After the player who won the tile has claimed any trophy cards he can, including using 3 for 1 trades, the other player may claim one trophy card if he can, using 3 to 1 trades to do so. Since the use of 3 for 1 trades can have a cascading effect, the player who won the tile takes precedence in claiming trophies. Thus, the player who won the tile can again claim as many trophies as he can after his opponent has claimed one, and so on. Example: Mike has already claimed the red Imply card and has 2 gray, 3 blue, 3 green, and 5 yellow cubes. Kevin wins a tile, giving him 3 yellow, 3 red, 5 green, 3 blue, and 2 gray cubes. He claims the green and blue trophies, using 3 red cubes as a blue cube. Mike may now claim the gray trophy using 3 blue cubes as 1 gray cube. As Kevin can claim no trophy, Mike claims the yellow trophy using 3 green cubes as 1 yellow cube, winning the game! Had Mike chosen to claim the yellow trophy first, Kevin would have been able to win the game by claiming the gray trophy before Mike using his 3 yellow cubes as 1 gray cube. Note: a player is not obligated to use the 3 for 1 trade when he first can. He may wait for a time that is best for him, but if he waits too long, he may give his opponent the chance to make a similar trade for a trophy card. Near the end of the game, it can happen that there are not enough victory cubes in the bag for a player to fill a balloon hop tile. If this happens, the player removes the balloon hop tile from the game and play continues with fewer tiles. The game ends immediately when a player takes a third trophy card. This player is the winner!